Outline Sam and Castiel travel into Dean's mind to help him regain control while they have Michael captured. Meanwhile, Jack and the hunters from Apocalypse World contend with Michael's monster army descending on the Bunker. Rocky's Bar is the ultimate dive, complete with pool table, jukebox, and passed-out customer. The peaceful tableau is broken when Pamela Barnes batters her way through the door and out of the storm raging outside. She exclaims that she managed to get the limes for the house special before handing them over to the bar owner -- Dean -- who proceeds to make them the house special of a shot of tequila and a beer, and explains that Sam and Cas are away dealing with a ghoul in Wichita but should be back that night. Their drinks are disturbed as a lawyer enters and offers to buy the bar for what is evidently not the first time. Dean refuses, again, as he's "never had anything so nice" as Rocky's. Later, in the office, Pamela asks Dean why he continues to refuse the lawyer and he tells her the bar is his "dream." Dean is in the stockroom when Pamela calls for help as trouble is coming. A vampire enters the bar and announces that he is seeking revenge for the Winchesters destroying his entire nest. Suddenly the drunken guy at the bar wakes up and is also a vampire. Both vampires are swiftly dispatched and Pamela is left wiping blood off of Dean's face. Meanwhile, at Hitomi Plaza, Michael is back in control of Dean and is once again dressed in his favorite suit. Using his angelic powers, he causes Sam, Castiel, and Jack to collapse in pain while he monologues on how he watched everything from the door he left "open" in Dean's mind. Castiel takes advantage of Michael's arrogant showing off to distract him so Sam can throw a holy oil Molotov cocktail at him. The fire allows Cas to bind Michael with the improved angel cuffs. Although trapped, Michael remains cocky and mocks the Winchesters over the attacks going on in the city -– which Maggie confirms over the phone is about turning others, not killing them -- while monsters try to break into the Penthouse. Seeing no alternative, Sam shouts for the reaper Jessica for assistance. Another reaper named Violet appears instead and explains that the reapers now work shifts because the Winchesters cause so much trouble. At first Violet refuses to help but then seems to get silent orders from someone before they are all to transported to the Bunker. Leaving Michael chained to a pillar in the map room, Sam takes Cas and Jack aside and explains that their only hope is to somehow enter the dream world that Michael has trapped Dean in, much like Crowley did to save Sam from Gadreel. Maggie calls and Sam informs her that they are back at the Bunker but asks that the Apocalypse World hunters check that Garth is still okay in the trunk of the Impala. However, Maggie replies that the monsters have ceased their assault on Kansas City and are now heading west. Michael goads them about the fact the monsters are coming to the Bunker and that one way or another, everyone will die and the last thing Sam will see is Dean's "pretty smile" as Michael rips him apart. 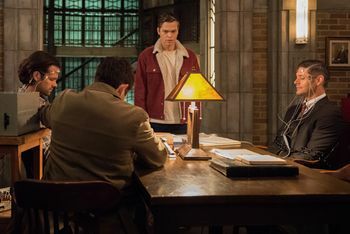 In the library, Sam and Cas are setting up the Men of Letters apparatus, hoping that it will allow them to enter Dean's mind and wake him from his dream. Back in Dean's mind, the scenes and conversations from Rocky's continue their never-ending loop with only slight alterations. Even so, when Dean mentions Sam and Cas' ghoul hunt again, he gets "serious déjà vu." Meanwhile, Jack is left alone with Michael, who takes the opportunity to attempt to break him by saying Jack is meaningless and that to Dean, Jack is nothing but a burden and that he didn't care when Jack died. Michael goes on to claim that to Sam, Dean, and Castiel, Jack is nothing but a job none of them wanted. His undermining of Jack is interrupted by the arrival of Castiel, who sends Jack to help Sam and assures him that Michael is lying. Having failed at breaking Jack, Michael now turns his attention to undermining Castiel's faith in himself and in God. He argues that the Apocalypse World and this world are just Chuck's failed drafts and that Chuck, being a writer, has just moved on to try again. This realization, Michael admits, has caused Michael to burn every world until he finds Chuck and kills him. On the outskirts of Lebanon, Maggie has gathered the Apocalypse World hunters and together they create a road block so that Michael's army cannot pass. Her rallying speech is interrupted by the arrival of a black van which stops a little way up the road. After no sign of movement from the van, the Apocalypse World hunters go to investigate. One of the group, Tiger, realizes the van is empty and follows some tracks into the wood without backup, despite being called to stop. Maggie and the others wait nervously for something to happen but Tiger eventually returns unhurt, saying the monsters appear to have headed to the Bunker on foot. As Sam sets up the Men of Letters machine, Jack offers to use some of his power to save Dean if Sam's plan doesn't work, but Sam refuses, saying Dean would not want to be saved at the cost of Jack burning off some of his soul. Cas attaches Sam and Michael to the machine then hitches a ride via Sam, leaving Jack behind to "pray" and make sure nobody kills them. Sam and Cas arrive in the middle of absolutely nothing, so Cas begins to scan through Dean's traumatic memories, such as Hell, hoping to find him. Sam quickly realizes that Dean thrives on trauma and in order to keep Dean occupied and under control, Michael would keep him trapped somewhere he was content. Among the memories, Sam identifies one he doesn't recognize and tells Cas to take them there. Dropping into Rocky's, Dean welcomes them back from the hunt he thinks they've been on by offering them a great IPA from Austin. Before they can answer, however, Pamela arrives, causing Sam to struggle with staying focused despite the guilt and loss he clearly still feels over her death. Pulling himself together, Sam begins to explain to Dean that he's been trapped in a fantasy by Michael, but their conversation keeps being interrupted by the loop moving on to the next false memory. Sam starts to crack the illusion by reminding Dean that Pamela was not only blind but also died years before. This causes her to disappear, yet Dean is still struggling to believe the truth until Sam remembers to say "Poughkeepsie", causing all of Dean's memories to flood back. A slow clap announces Michael's arrival in the bar and, once again, he tries to undermine Sam, Dean, and Castiel's faith in one another by saying that Dean said "yes" to being a vessel because he was so desperate to be rid of the others for good. Despite his attempt to divide and conquer, Cas sees through Michael's behavior and concludes that he is just hoping to stall until his monsters come to the rescue. They call Michael's bluff and Dean tackles him. When he is thrown aside, Sam attacks, followed by Cas. Michael taunts them with the fact that even if they do expel him from Dean, he'll make sure that Dean is nothing more than "blood and bone." This spurs Dean to realize that it's his mind and his rules, so with Sam and Castiel's help, they trap Michael in Rocky's stockroom, making Dean "the cage." Back at the Bunker, the hunters have arrived and prepare to fortify and protect the unconscious Winchesters. The monsters reach the Bunker and enter easily, as Tiger had been killed and replaced with a shapeshifter who left the Bunker door open when they returned. Panicking, the hunters pointlessly shoot at their attackers but are quickly overwhelmed, causing Jack to use his soul-boosted powers to disintegrate the invading monsters. In the aftermath, Maggie debriefs Sam on what happened to the rest of the monsters and Sam thanks her for saving them but she confesses it was Jack who saved everyone using his angel powers. Sitting together in the kitchen, Cas confronts Jack over using his powers and points out that he can't afford to use up his soul, for his and everyone else's sake. Elsewhere, Dean is in his bedroom, trying to drown out the sound of Michael attempting to fight his way out of Rocky's stockroom, when Billie appears. Dean thanks her for breaking the rules and saving them from Hitomi Plaza. Billie, however, has more pressing news for Dean and describes how every book in her library has now changed to say that Michael escapes and burns the world. Every book, that is, except the one she leaves with him so that he can decide what to do with the information within. Michael: Now, this just feels right. Hope is an amazing thing, isn't it? You had no chance of winning this. None. But you had hope -- hope that I wouldn't see you coming, but I saw everything. And now I have my perfect vessel. I've just destroyed the one weapon that could really hurt me. Thanks for bringing that, by the way. Violet: Well, my name's Violet. It's my shift. We have shifts now, because you mess up so, so many things. Michael: Yes, uh, put a chair against the door. That'll help. Nothing's changed. Either my monsters get here or I break these chains. But tonight... everybody dies. And, Sam? The last thing you'll see is this pretty smile as I rip you apart. Jack: Sam and Dean -- they're gonna beat you. Michael: Oh, please. Sam's in so far over his head, he's drowning. And Dean? Well, I've got Dean under control. Jack: No. Dean -- he's strong. Michael: He's a gnat. I'm a god. Who would you bet on? Jack: You don't know anything about Dean. Michael: Because I can. Because... me and my brother -- my Lucifer -- when we fought in my world, we thought that God would come back, give us answers -- why He'd gone, what we'd done -- but, instead, do you know what happened? Nothing. No God. Nothing. And now... now that I'm in here -- now I know why. God -- Chuck -- is a writer, and like all writers, He churns out draft after draft. My world? This world? Nothing but failed drafts. And when He realizes that they're flawed, He moves on and tries again. Castiel: No, that's not how... Why would He do that? Michael: Because He doesn't care! About you, me -- anything. Now, at first, I thought I'd do it better. Show Him. Be more God than God. But now... I just want to burn every one of His little worlds until I catch up to the old man. Jack: Well, if it doesn't, maybe there's something I can do. The magic that's keeping me alive, what if I can do more? Sam: And burn off your soul? Jack: Not all of it. Sam: Jack. Dean wouldn't want to be saved, not that way. Sam: Dean thrives on trauma. I mean, he's had to his whole life, right? It keeps him alert, keeps him ready, but if I wanted to distract Dean, I-I... I'd give him something he's never had before. Sam: Exactly. So maybe, instead of looking through his bad memories, maybe let's look through his good memories. Michael: Well, this is fun. Dean: Get out of my head. Michael: You don't mean that, Dean, not really. You may lie to them, but, deep down, I know you. I am you. You only tolerate the angel because you think you owe him, because he 'gripped you tight and raised you from Perdition.' Or whatever. But since then, what has he done? Only made mistakes, one after the other. And, Sam -- oh, Sam... You know, Dean was his happiest when you quit hunting, leaving him with your dad, just the two of them. See, deep down, he knows that you will always abandon him, again and again. Michael: You fellas didn't think this out, did you? Even if you could force me out, what do you think I'd leave behind, hm? You'd be nothing but blood and bone. Dean: Then we don't kick him out. We keep him in. It'll hold. My mind, my rules. I got him. I'm the Cage. Dean: You broke the rules. Billie: I took a calculated risk. I warned you about the dangers of jumping from world to world. But you ignored me, didn't you? Dean: Rescuing Mom and Jack, helping out those other folks -- I'd say it was worth it. "Nihilism" is the belief that nothing in life matters, and everything is meaningless. It is also a reference to Michael's state of mind, since he believes that God has come to consider the Winchesters' world and Apocalypse World "failed drafts" and they are thus meaningless. Dean's dream bar in his subconscious, "Rocky's Bar" contains many Easter eggs. There is also a stuffed squirrel wearing an aviator's cap and goggles as Rocky does in the cartoon behind the bar, holding a bottle of Margiekugel -- a beer created for the show that features regularly and is named for Production Designer Jerry Wanek's mother. The wooden monkey behind the bar originally lived on the corner of the bar at Harvelle's Roadhouse. In 2.02 Everybody Loves a Clown when the boys first visit the Roadhouse, Ash is passed out drunk on the pool table, referenced here with the vampire pretending to be passed out at the bar. There is an Impala tribute behind the bar including two photos of the Impala and the KAZ 2Y5 license plate. There is a "Texan Star" neon sign. Jensen grew up, and still lives, in Texas. There is a neon "Tom's Tequila" sign - a reference to director Thomas J. Wright. Dean: Got this great IPA from Austin -- Cosmic Cowboy. You're gonna love it. Cosmic Cowboy IPA, along with the other beers on tap -- Ghost White IPA and Fox Rye Lager -- are beers from Jensen's Family Business Beer Company located in Austin, Texas. The beer coasters also feature the Family Business Beer Co. logo. There is a Family Business Beer Company neon sign on the wall opposite the bar. Billie: And just look at you now. Do you remember visiting my reading room? The shelves and shelves of notebooks describing the ways you might die? Billie: Well, it's the funniest thing, but they've all been rewritten. They all end the same way now -- with the archangel Michael escaping your mind and using you as his vessel to burn down this world. Billie: All of them. Except one. Billie revealing to Dean how his deaths have all been rewritten as the same thing -- Michael escaping and destroying the world -- except for one, is similar to Avengers: Infinity War, where Doctor Strange looks into fourteen million, six hundred and five possible outcomes against Thanos, all of which result in their defeat, except for one. Sam uses a holy fire molotov cocktail on Michael to distract him long enough for Cas to restrain him with the modified angel cuffs. Castiel previously used the same molotov cocktail method on Michael in 5.22 Swan Song. However, Michael was banished for a few minutes before being imprisoned in the cage with Lucifer, Adam, and Sam, reasserting Lucifer's claim that the Apocalypse World version of Michael is more powerful than his Prime Earth counterpart from 13.07 War of the Worlds. According to Michael, in Apocalypse World, they had "locked Death away and enslaved the reapers." He also reveals his belief that while there may be multiple universes, there is only one God. Sam: Okay, listen. Back when Gadreel possessed me, he -- he created, uh, I don't know, like a -- like a fake world inside my head. But Crowley was able to force his way in, he showed me how to take control, and I drove the angel out. This refers to the events of 9.10 Road Trip. And much like Sam's dream world created by Gadreel, Sam is also working a ghoul case in Dean's mind, though we are unaware if it also involved cheerleaders. Sam: It's the, uh, messed up British Men of Letters thing they used to get inside people's heads. I figure if I can get in, maybe I can wake Dean up, get him to fight, you know, to force Michael out. The device Sam refers to is the same one Lady Antonia Bevell used to brainwash Mary Winchester and then to get Dean into her head in 12.22 Who We Are to save Mary. (0:18-0:28) 2.22 All Hell Breaks Loose: Part Two – Dean's monologue to Sam’s dead body. Dean: You know, when we were little, you couldn’t have been more than five, you started asking questions. (0:20) 3.04 Sin City – Dean is trapped with the demon Casey, and Sam comes to save him, unknowingly accompanied by another demon, father Gil. Father Gil attacks Sam and Bobby. Dean: Sammy, down here! The basement caved in! (0:23) 13.23 Let the Good Times Roll – Micheal reneges on his agreement to let Dean be in the driver’s seat. Sam: Hold on, okay? We’re coming. (0:25) (3.10 Dream a Little Dream of Me – confronted by his fears of Hell and all of his insecurities. Demon!Dean Vision: You can’t escape me, Dean! You’re gonna die! And this, this is what you’re gonna become! (0:27- 0:39) 7.10 Death's Door arguing with Sam about Chuck Norris vs Bruce Lee on movie night in one of Bobby’s best memories. Dean: I don’t even know you right now! It’s not even a contest. Sam: It depends on the criteria. Dean: Survival is the only criteria, all right? And when the crap hits the fan, it’s not about who has skill. It’s about who’s the bigger badass. (0:30) 3.16 No Rest for the Wicked – Dean in Hell. Dean: Somebody help me! Sam! (0:34) 12.23 All Along the Watchtower – Cas getting stabbed by Lucifer. Demon!Dean Vision: Your own father didn’t care whether you lived or died. Dean: I remember I begged you, quit askin’ Sammy, man, you don’t wanna know. (0:46-0:57) 3.10 Dream a Little Dream of Me – see 0:25 I think almost this whole scene is in there in the background. Demon!Dean Vision: What are the things that you want? What are the things that you dream? I mean, your car? That’s Dad’s. Your favorite leather jacket? Dad’s. Your music? Dad’s. Do you even have an original thought? (0:59) 5.22 Swan Song – Lucifer!Sam beating up Dean. Dean: I’m not gonna leave you. (01:15) 2.05 Simon Said – They’re looking through Andy’s van. Sam: Hegel, Kant, Wittgenstein? That’s some pretty heavy reading, Dean. Demon!Dean Vision: All he ever did was boss you around. (01:20) 1.02 Wendigo – Dean explains to Sam that he thinks John wants them to hunt together because he left them his journal. Dean: Y'know, saving people, hunting things, the family business. Dean experiences flashbacks of Pamela Barnes' eyes being burned out by Castiel from 4.01 Lazarus Rising and Pamela being killed by a demon from 4.15 Death Takes a Holiday. He also has flashbacks of Michael's actions from 14.01 Stranger in a Strange Land and 14.02 Gods and Monsters. Dean telling Sam "I got him" after trapping Michael in his mind mirrors what Sam said when he was able to wrestle control from Lucifer in 5.22 Swan Song. Billie reminds Dean of his visit to Death's Reading Room and their conversation in 13.05 Advanced Thanatology as well as that she would see him again soon from 13.19 Funeralia. By the end of the episode, Garth is still locked in the trunk of the Impala in Kansas City, Missouri. This page was last edited on 28 February 2019, at 05:57.